This first dedicated, all-encompassing text characterizes nanomaterials intended for biological or physiological environments and biomedical applications, in particular for medicine, healthcare, pharmaceuticals and human wellness. 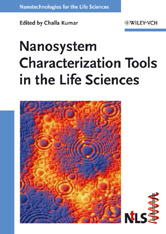 It finally fills the gap for a concise overview of a wide range of different characterization techniques and how to best employ them in the context of nanoscale life science research. It thus serves as a single source of information gathering up the knowledge otherwise spread over many journal articles, and provides an overall picture to members of all the disciplines involved. This handy volume covers all important probing techniques, including nuclear and electron spin resonance, light scattering, infrared and Raman spectroscopy, atomic force microscopy, magnetic resonance, tomography, x-ray techniques, and microbalance measurement of antibody binding.Biochemists, biologists, chemists, materials scientists, and materials engineers as well as all others working in the pharmaceutical and chemical industries or at related research institutions will here a book of great value and importance.